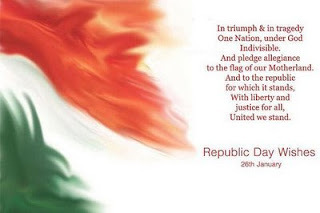 Lost in Thoughts: Republic Day Wishes to u all..
Republic Day Wishes to u all..
As U all guys knw that we all celebrate republic day on 26th of Jan every year as it was the day where our Constitution is formed in 1950.Now we are celebrating our 60th Republic celebrations. President Pratibha Patil hosted the Flag at Red Fort.This time Kazakhstan President Nursultan Nazarbayev was invited for celebrations.Steeped with symbolism ,President Pratibha Patil gave away the highest peacetime military awards to 11 policemen and soldiers posthmously who fought in Mumbai attacks. We salute u all.Lastly ,I wish My Mother a very Happy Birthday as she is celebrating her birthday today.